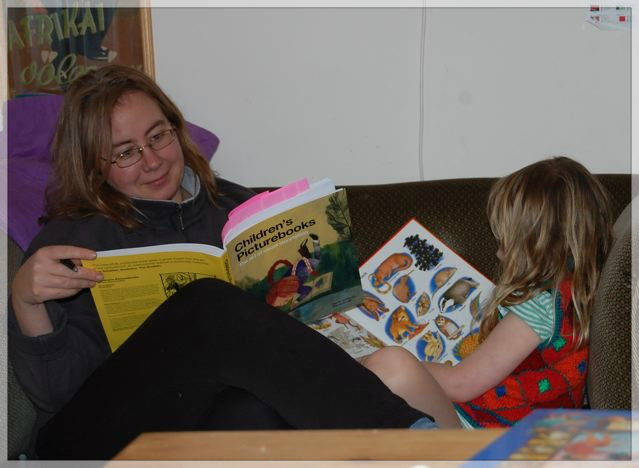 Zoe has been writing for almost 3 years about the books she and her young family read together, and the crazy, fun stuff they all get up to inspired by these shared stories. You can find out more, read book reviews, learn about authors/illustrators with indepth interviews and discover ideas for creative play born from books at Playing by the book. We're a book-loving home and a play-loving home: We play out the books we're reading and we invent games based on stories we've listened to. Books become living, breathing experiences, beyond the printed page, and in doing so, our books and the play inspired become a magical thread that weaves through many treasured family memories. *Because it's fun! As an adult you get to play with Lego, you get to sprinkle glitter, you're allowed to try new things without any risk! *Because it gives me a focus and outlet for my desire to be creative. A creative life is a more enjoyable life, and being creative with kids is just great for adults - no special skills are required, and mishaps and mess are all forgivable. *Because it helps me find a mutually enjoyable way of being with the kids - For some adults it comes as second nature to lie on the floor with their kids playing games. But what if playing with your kids doesn't come naturally? What if you and your kids want ideas for what to do? Turn to a book and play it! Straight away there's an easy "how to" - read the book together and then choose one aspect of it to bring to life, whether that is (for example) literally acting a part of it out with soft toys or making the castle that appears in the story. *Because it shows the kids how much I value the book- We all want our children to develop a love of reading and one of the seeds for this is for them to see their grown-ups being passionate about books. Maybe you don't read many novels for adults, maybe you don't call yourself a reader (I certainly didn't when my kids were very young), but you can still show your kids you love books, by giving the stories you read together a life of their own. So I've told you why I love to play by the book, but where do I get my ideas from? *The book itself - Sometimes we try to copy, quite literally, what we find in the book. 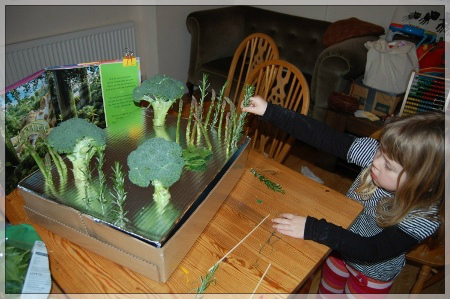 For example, we recently read a book where the illustrator made landscapes out of food so we emptied our fridge and did the same. As always happens when we try to imitate closely what we find in a book, we develop a new appreciation for the skills of the illustrator/author. *Google - A book may contain something we want to try making. To find fresh ideas about how to make that dragon / hot air balloon / whatever else, I turn to Google Images. I type in a search " X (eg dragon) kids activities blog". This brings up a list of images of my chosen subject, which have appeared on personal blogs (rather than, for example news websites). Any images which appeal I click on to find the source, which will often contain a tutorial, not just an image - this is the reason why I include "kids activities blog" in my search terms. *Pinterest - Using Google images is a little like brainstorming, but then to collate and catalogue my finds I use Pinterest as this is a very easy way to organise inspirational ideas. *Craft books - I'll often bring these home from the library, or pick them up 2nd hand for me to browse and get ideas. They are also good for kids to read, what with their short paragraphs and many illustrations. *Websites - The Crafty Crow is my one stop shop online for great ideas. Use her search function to find activities on a specific topic. *The world around me - If I spot something interesting whether that is in a shop, a museum, a playground I try to note it down for a possible activity in the future. 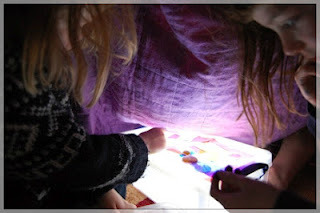 For example, we recently made a light box, having got the idea from something similar we'd seen in an museum exhibition on stained glass. *baking a cake based on an image in the book. See the book in your lap like a magic lamp - set free the story to weave its magic into your family's life! Fantastic post, thanks. My Little Man loves books. Whenever I sweep the floor it always ends up as 'Room on the broom' with me clambering on asking if there is 'room on the broom for a mum like me'. Will contact you via your blog for something we are going to be launching work wise for halloween which your might like to review but it's not quite ready yet. Great post and wonderful ideas! Especially the broccoli scene there. I'm really impressed! @childtasticbooksReading and food always seem to me to be a natural combination! Thanks for your comment. Natasha, there is always room on the broom for mums like us, and hooray for that! This is such a great post because you gave us hte tool to find information ourselves. I love that! We recreate our books sometimes but I don't do it enough. Thanks so much for the inspiration to try and do an extra activity for each book we read! @PennyDo stop by Zoe's blog, Penny. There is a treasure trove of ideas there perfect for creative mums like you!